Figure 2-5. Most learning occurs through sight, but the combination of sight and hearing accounts for about 88 percent of all perception. 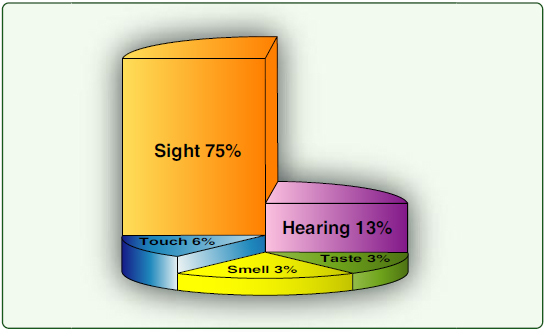 Perception involves more than the reception of stimuli from the five senses; it also involves a person giving meaning to sensations. People base their actions on the way they believe things to be. The experienced AMT, for example, perceives an engine malfunction quite differently than does an inexperienced student. This occurs because the beginning aviation student is overwhelmed by stimuli and often focuses on meaningless things, thus missing key information. It is important for the instructor to direct trainee’s perceptions initially so that the student detects and perceives relevant information. Real meaning comes only from within a person, even though the perceptions, which evoke these meanings, result from external stimuli. The meanings, which are derived from perceptions, are influenced not only by the individual’s experience, but also by many other factors. Knowledge of the factors that affect the perceptual process is very important to the aviation instructor because perceptions are the basis of all learning. The physical organism provides individuals with the perceptual apparatus for sensing the world around them. Pilots, for example, must be able to see, hear, feel, and respond adequately while they are in the air. Perceptions depend on one’s values and goals. Every experience and sensation, which is funneled into one’s central nervous system, is colored by the individual’s own beliefs and value structures. Spectators at a ball game may see an infraction or foul differently depending on which team they support. The values of the student are important for the instructor to know, because this knowledge assists in predicting how the student interprets experiences and instructions. Goals are also a product of one’s value structure. Things that are more highly valued and cherished are pursued; those accorded less value and importance are not sought after. Self-concept is a powerful determinant in learning. A student’s self-image, described in such terms as “confident” or “insecure,” has a great influence on the total perceptual process. If a student’s experiences tend to support a favorable self-image, the student tends to remain receptive to subsequent experiences. If a student has negative experiences, which tend to contradict self-concept, there is a tendency to reject additional training. A negative self-concept inhibits the perceptual processes by introducing psychological barriers, which tend to keep the student from perceiving. They may also inhibit the ability to properly implement what is perceived. That is, self-concept affects the ability to actually perform or do things unfavorably. Students who view themselves positively, on the other hand, are less defensive and more receptive to new experiences, instructions, and demonstrations. It takes time and opportunity to perceive. Learning some things depends on other perceptions, which have preceded these learnings, and on the availability of time to sense and relate these new things to the earlier perceptions. Thus, proper sequence and time are necessary. A student could probably stall an aircraft on the first attempt, regardless of previous experience. Stalls cannot really be learned, however, unless some experience in normal flight has been acquired. Even with such experience, time and practice are needed to relate the new sensations and experiences associated with stalls in order to develop a perception of the stall. In general, lengthening an experience and increasing its frequency are the most obvious ways to speed up learning, although this is not always effective. Many factors, in addition to the length and frequency of training periods, affect the rate of learning. The effectiveness of the use of a properly planned training syllabus is proportional to the consideration it gives to the time and opportunity factor in perception. The element of threat does not promote effective learning. In fact, fear adversely affects perception by narrowing the perceptual field. Confronted with threat, students tend to limit their attention to the threatening object or condition. The field of vision is reduced, for example, when an individual is frightened and all the perceptual faculties are focused on the thing that has generated fear. Flight instruction provides many clear examples of this. During the initial practice of steep turns, Beverly may focus her attention on the altimeter and completely disregard outside visual references. Anything Bill does that is interpreted as threatening makes Beverly less able to accept the experience Bill is trying to provide. It adversely affects all her physical, emotional, and mental faculties. Learning is a psychological process, not necessarily a logical one. Trying to frighten a student through threats of unsatisfactory reports or reprisals may seem logical, but is not effective psychologically. The effective instructor organizes teaching to fit the psychological needs of the student. If a situation seems overwhelming, the student feels unable to handle all of the factors involved; a threat exists. As long as the student feels capable of coping with a situation, each new experience is viewed as a challenge. A good instructor recognizes that behavior is directly influenced by the way a student perceives, and perception is affected by all of these factors. Therefore, it is important for the instructor to facilitate the learning process by avoiding any actions which may inhibit or prevent the attainment of teaching goals. Teaching is consistently effective only when those factors that influence perception are recognized and taken into account.